ST. MARTINVILLE, La. (CNS) — The Diocese of Lafayette planned to hold a “Jubilee of the Word” marathon in the town square of St. Martinville as one of its events to close out the Jubilee Year of Mercy. The special year, beginning Dec. 8, 2015, and ending Nov. 20, was called by Pope Francis as a celebration of God’s mercy. For the “Jubilee of the Word” marathon in St. Martinville, the Bible is to be read publicly cover to cover without pause starting Nov. 17 at 6 a.m. (local time) and ending on Christ the King Sunday, Nov. 18, at 8 p.m. local time. It will be live-streamed on the web by the diocese’s radio and TV outlets at www.diolaf.org. Other coverage can be found by searching Facebook for the “Fete-Dieu du Teche” page. Over 250 lectors from the Lafayette Diocese, joined by members of other faith communities, were scheduled to read for 20-minute intervals. “This celebration of the Word will bring together Catholics, Baptists, nondenominational Christians and members of the Jewish faith for the purpose of proclaiming, reflecting on and marinating in the holy word of God,” said Father Michael Champagne, superior of the Community of Jesus Crucified. The religious community, based in the Lafayette Diocese, is a prime sponsor of the event. “People everywhere love to exercise. It’s important to stay in physical shape, which is why many people participate in Iron Man races, triathlons and marathons. And we wanted to provide a way for people to spiritually exercise,” said Father Champagne, who also is director of Fete-Dieu du Teche. He said the event also commemorates National Bible Week, observed Nov. 13-19 this year, and the 50th anniversary of the Second Vatican Council’s Dogmatic Constitution on Divine Revelation (“Dei Verbum”). 2016. The Lafayette Diocese commissioned a special large Bible — 12 inches by 20 inches and weighing 25 pounds — to be used for the marathon. Father Champagne said it was sent to Rome for Pope Francis’ blessing. Besides English, passages will be read in French, Italian, German, Spanish and Vietnamese, representing the various ethnic groups in the diocese. “We hope to repeat this event in the near future at Angola, our state penitentiary, using this same Bible,” the priest said. The “Jubilee of the Word” marathon is one of a number of new evangelization works carried out by the Community of the Jesus Crucified, he said. 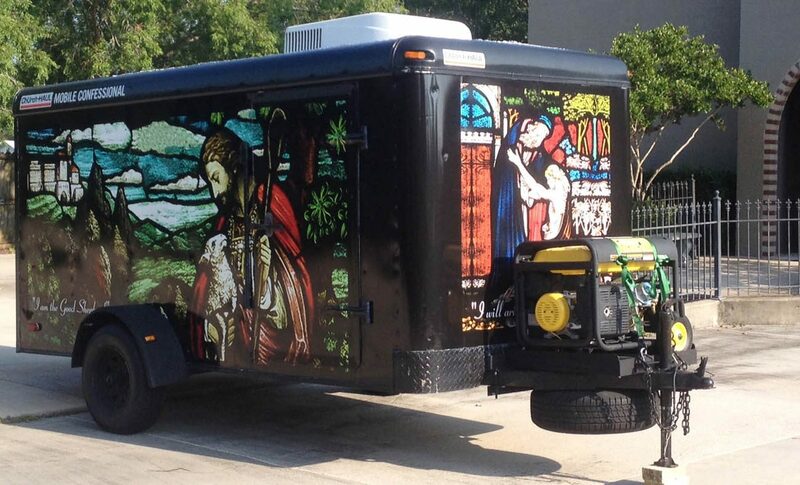 One effort has been a mobile confessional in the diocese, dubbed the Spiritual Care Unit-SCU. To date it has made about 130 stops, traveled over 6,000 miles and heard about 3,000 confessions. Confessions have been extended nursing homes and assisted-living facilities with a mobile unit called Church-Haul — an old U-Haul trailer retrofitted for wheelchair and handicap accessibility. In a few weeks, priest using that unit visited about 10 facilities and heard about 200 confessions. The Community of Jesus Crucified also organizes a number of festivals on the bayous in Louisiana to celebrate faith and culture. On Aug. 15, the feast of the Assumption, the community hosts the daylong Fete-Dieu du Teche, a eucharistic procession by boat to Catholic churches along Louisiana’s Bayou Teche.